Posted April 25, 2016 by William Martin & filed under Galleries. Sherlock actor, co-creator and writer Mark Gatiss has a role in the upcoming Ab Fab movie. Jennifer Saunders and Joanna Lumley are back as Edina and Patsy in the long-awaited feature film, alongside the rest of the original cast, including Julia Sawalha as Saffy, Jane Horrocks as Bubble, Kathy Burke as Magda, Celia Imrie as Claudia Bing and June Whitfield as Mother. > Buy the complete Absolutely Fabulous box set on Amazon. The movie’s official synopsis reads: “Appropriate for their big screen debut, Edina and Patsy are still oozing glitz and glamour, living the high life they are accustomed to; shopping, drinking and clubbing their way around London’s trendiest hotspots. “Blamed for a major incident at an uber fashionable launch party, they become entangled in a media storm and are relentlessly pursued by the paparazzi. 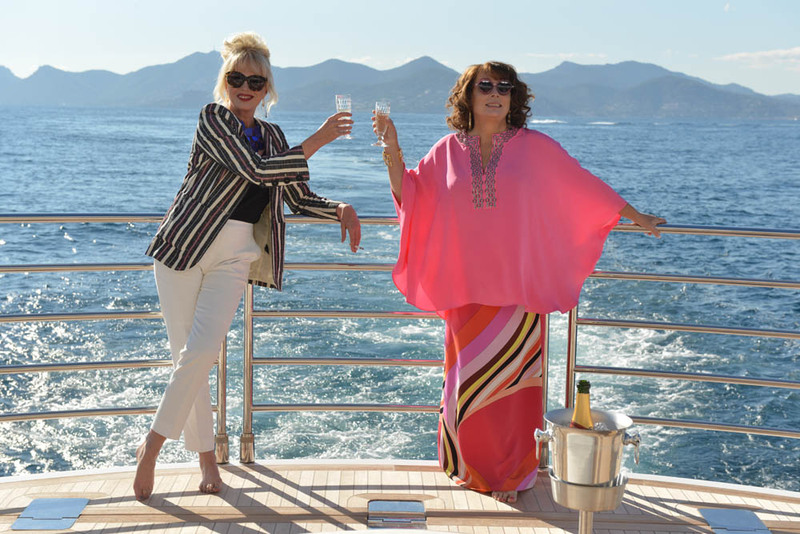 Absolutely Fabulous: The Movie was filmed last year on location in the UK and the south of France and arrives in UK cinemas on Friday 1 July. Ab Fab first aired in November 1992 and the most recent special aired in July 2012.